The fighting game genre has consisted of three main subgenres: 2D, 3D, and Platform. 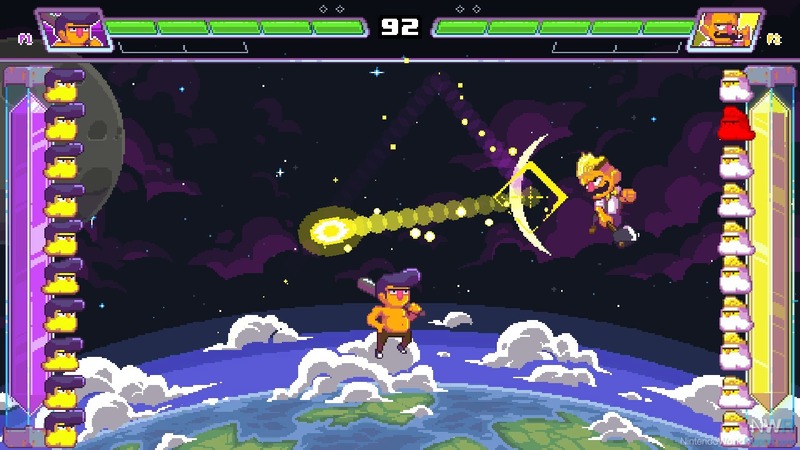 However, Mojiken Studio decided to challenge this idea by carefully mixing Pong and fighting games to make their beautiful creation, Ultra Space Battle Brawl. The idea seems absurd at first to combine the two, but they have done it in a way that creates fast-paced fun for anyone to enjoy. The story isn’t vast but allows the player to obtain a solid understanding of the mindset of each of the 10 unique playable characters. 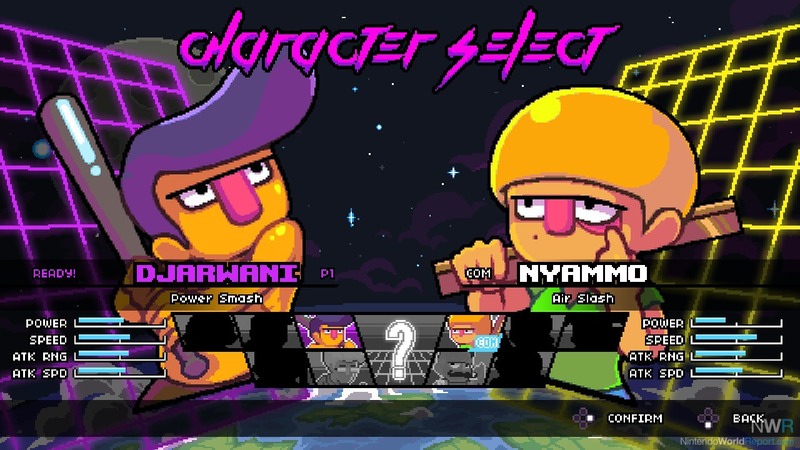 Each character has their own background and struggles that they hope to be resolved by entering the Ultra Space Battle Brawl or USBB. The battles are tough, but you gotta push through to make your greatest dream become a reality. The controls are quick and easy to understand: use the left stick to move, Y to hit the ball, A to activate your special ability, and R to dash. All of the playable characters have their own unique set of strengths and weaknesses that give them their own play style. For example, a character with high movement speed could have a low hit range or low hitting power to balance them out. The game is composed of two modes, story mode and versus mode. The story mode is comprised of a few different battles that steadily increase in difficulty. Completing the story mode grants access to multiple pieces of art of your chosen character. Versus mode allows for two people to battle one on one or four people to play in teams of two. Each battle has a 100-second time limit to either deal the most damage to the opponent’s crystal or to destroy it. To do this, you must slam the ball towards your opponent’s crystal while trying to defend your own crystal from your opponent’s attacks. One of the things I must praise this game for is its fantastic artwork and soundtrack. The art style is a nice blend of pixelated artwork and 80s Japanese aesthetics. This style gives the game its own personality that allows it to pop and stand out from other titles in the eShop. The soundtrack is a masterpiece. Composed by Manami Matsumae, famous for composing the soundtrack of the original Mega Man, each track is a burst of energy that sounds like 80s video game music while still being reminiscent of an intergalactic adventure. While there are many positive aspects of USBB, there are some minor yet recurring flaws I found. One was the occasional poor grammar and writing used in certain cutscenes. This can vary from a misspelled word to a sentence being completely butchered. I also found that there were various glitches that would occasionally occur. None were game breaking or really affected gameplay other than causing some lag, but nevertheless, even if the glitches aren’t harmful, they do stand out. 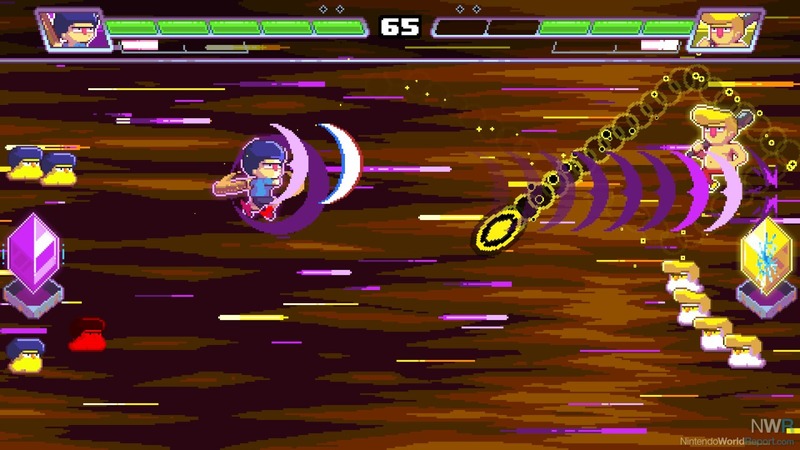 All in all, I feel that while Ultra Space Battle Brawl may seem strange and absurd at first, it is an enjoyable experience that you wouldn’t want to miss out on.